Hong Kong Disneyland debuts its second Marvel themed attraction – Ant-Man and The Wasp: Nano Battle! Experience the excitement of shrinking down to the size of an ant, as you fight alongside Ant-Man and The Wasp to prevent classified S.H.I.E.L.D. data from falling into the hands of Hydra. Go all-in to become part of this epic battle! Tony Stark (aka Iron Man) has set up a pavilion at Hong Kong Disneyland for visitors to learn about the new technologies Stark Industries is developing to keep the world safe. His innovation partner: the S.H.I.E.L.D. Division of Science & Technology. However, upon entering the Pavilion it becomes clear that this will not be just any ordinary visit. Hydra has launched a two-pronged attack, targeting both the Stark Tower in Kowloon and the pavilion itself! Arnim Zola, an evil artificial intelligence and agent of Hydra, has dispatched Hydra-bots to steal the Arc Reactor atop Stark Tower and has sent an army of Swarmbots to steal the Data Core from the S.H.I.E.L.D. 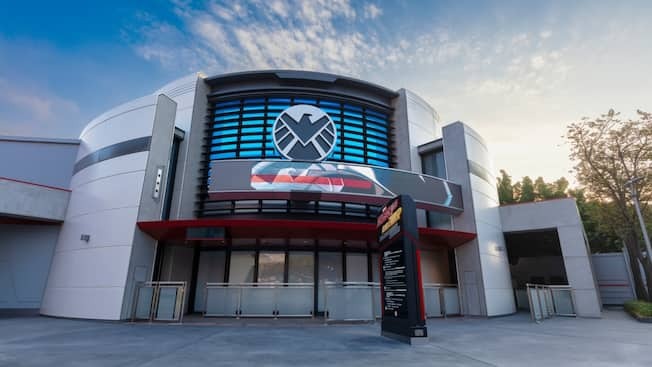 Science & Technology Pavilion – which contains all of S.H.I.E.L.D.’s secret research! While Iron Man is busy fighting Hydra at Stark Tower, he calls upon Ant-Man and The Wasp to help protect the Pavilion against thousands of Swarmbots under the command of Arnim Zola, bent on stealing the Pavilion’s Data Core. You will board S.H.I.E.L.D’s newest combat vehicle D/AGR aka the Dagger, and use its state-of-the-art EMP Blaster to disable the Swarmbots on your way to the Pavilion. However, with the Data Core under siege from a giant Hivebot, the only option you have is to join Ant-Man and The Wasp and shrink down to the size of an ant, and take the battle to the heart of Hivebot and take back the Data Core from Zola once and for all! !